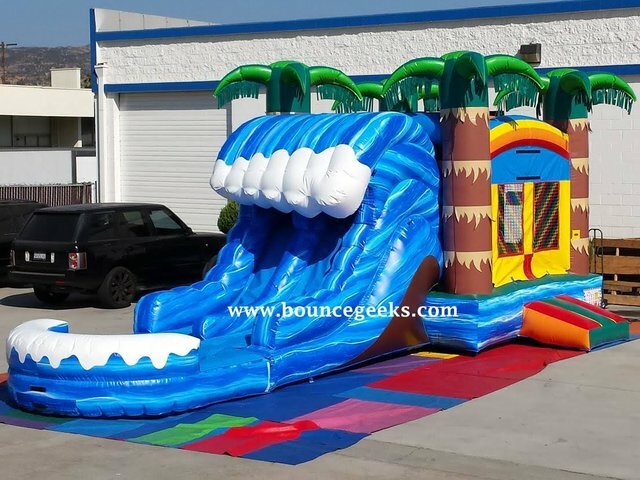 Tropical Wave Dual Lane Water Slide Combo Rentals | BounceGeeks.com Richmond, VA.
Wow! That's what they will say when they see this amazing Tropical Wave combo! This is an awesome inflatable combo, providing a huge bouncing area, a climbing ramp, a basketball hoop, and a dual lane slide. At the bottom of the slide there is a splash pool which is super fun when you attach your garden hose. Note: basketball is not included. If you want to use a ball, it MUST be something soft so no one gets hurt!